FIGURE 1 ■ Patient is placed in the full flank position. Padding is placed under all pressure points. Patient is flexed and the kidney bar is raised to maximize the space between the lower ribs and the iliac crest. The patient is secured to the bed with three strips of tape placed circumferen-tially around the patient and table in the indicated positions. The primary camera port is placed at the tip of the 12th rib. The two working ports are placed at the angle of the 12th rib and psoas/paraspinal muscles and 3 cm above the iliac crest in the mid-axillary line. 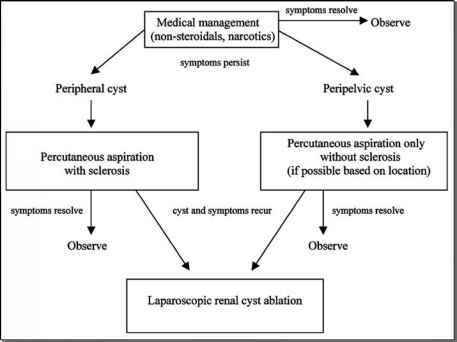 FIGURE2 ■ Optimized operating room configuration and surgical team positions for a right-sided retroperitoneal laparo-scopic nephrectomy. Occasionally, particularly in younger patients, the thoracolumbar fascia is too dense to be pierced with a fingertip. A hemostat is then employed to enter the retroperitoneal space. Precise dissection between the psoas muscle and the posterior aspect of Gerota's fascia is critical. Failure to do so will adversely affect retroperitoneal balloon dilation. Blind placement of the Verses needle can result in insufflation of retroperitoneal musculature or accidental pneumoperitoneum. The open Hasson technique is faster and safer and considered the preferred technique. deterrent stockings are applied. The patient is then placed in the full flank position with the pathologic side up. Protective gel or foam padding is applied to all pressure points, the weight-bearing axilla is protected with an axillary role and the limbs are positioned in an ergonomically acceptable position. The patient is then secured to the operative table with circumferential 3-in. surgical tape at the chest/shoulder, hip, and lower leg (Fig. 1). Alternatively, a surgical bed "bean bag," such as the Olympic Vac Pac, can be used to secure the patient to the operating table. 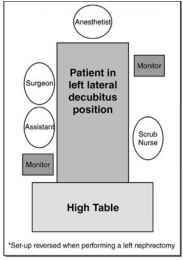 The operating room and surgical team are position in the manner shown in Figure 2. A Mayo stand is positioned at the foot of the bed so that the nurse can organize equipment. The surgeon and assistant are positioned on the posterior or backside of the patient. The scrub nurse stands at the foot of the bed on the other side or abdominal side. Display monitors are positioned on either side of the patient. To minimize the clutter of tubes and equipment, it is helpful to organize the cautery cords, insufflation tubing, camera, and suction and irrigation tubing so that all tubes and cords pass off away from the surgeon and are clamped under one edge of the pocket drape on the patient's abdomen.